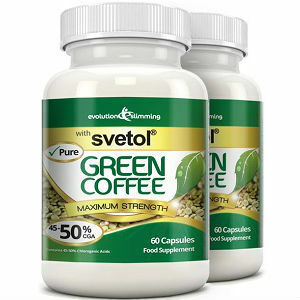 Pure Svetol Green Coffee Bean 50% CGA is a weight loss supplement manufactured by Evolution Slimming which claims to work as a fat burner and as an antioxidant. This supplement boasts of being rated 4.5 out of 5 on the Evolution Slimming’s website. Its producer alleges it is clinically proven to help in weight loss and fat burning. This product contains only a trace amount of caffeine and is suitable for vegans and vegetarians. The manufacturer also claims that this product harnesses coffee benefits in a plant concentrate to offer proven effectiveness for beauty and slimming. Chlorogenic Acid (90mg) is the main ingredient in this weight loss supplement which is extracted from Svetol Green Coffee (200mg). We conducted our own research and found that chlorogenic acid can be helpful in promoting the conversion of stored fat into energy leading to weight loss. Other ingredients found in the capsule shell of this product include microcrystalline cellulose and magnesium stearate. This formula doesn’t contain wheat or gluten. The manufacturer clearly explains how you should take this dietary supplement. You should take one capsule 30 minutes before breakfast, and another capsule 30 minutes before lunch. They recommend that every capsule should be taken with a large glass of water. We have not yet come across any adverse side effects associated with the use of Pure Svetol Green Coffee Bean. The manufacturer states that their supplements are derived from natural ingredients. However, they recommend consulting your doctor first before using this product if you are on medication, have a long-term health condition or are pregnant. They have not indicated whether this formula is suitable for children below 18 years. It is important to be aware that this product does contain a small amount of caffeine, so people who are sensitive to it should keep this in mind. A bottle of Svetol Green Coffee Bean 50% CGA containing 60 capsules is currently retailing at $31, down from the recommended retail price of $49. Two bottles are retailing at $55 while 3 bottles are selling at $73. These prices are inclusive of the shipping costs if you live in the UK and Northern Ireland. The manufacturer promises to ship to any country across the world. In case you don’t get your order, they will refund your cash. We did not come across any information regarding a money-back guarantee for unsatisfied customers on their official website. However, they promise to refund your cash if your product is not delivered. There are plenty of positive customer reviews and comments on their website. However, it was hard to tell if the reviews and comments are from legitimate users. Svetol Green Coffee Bean 50% CGA seems that it could be a good product for weight loss. The ingredients are all natural and have been shown to be effective in weight loss. In addition, you are refunded your cash if you don’t receive your order. However, this supplement doesn’t come with a money-back guarantee if you are not happy with the product. Its price is also relatively higher when compared with other weight loss products in the market. Edward Tobias	reviewed Evolution Slimming Pure Svetol Green Coffee Bean	on December 12th	 and gave it a rating of 2.5.